Lately there have been some changes within Instagram and they have and will have an effect on how we market to our customers and audience. That being said, I have some good news and some bad news for you. We’ll go with the bad first, because I like to counter it with some good news. I’m optimistic like that. 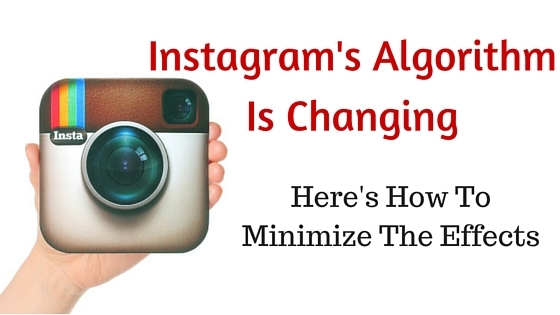 Instagram is changing it’s algorithm. It will no longer show posts in chronological order. Soon you will see suggested posts and relevant posts first. According to Instagram, the posts you see first will be those that they think you will be most interested in based on past behavior. This is very similar to that on Facebook where they show content to you based on what you like and engage with. Some of us marketers welcome this with open arms. More reach can be a good thing. But with a bad taste in our mouths still over the Facebook changes, many are skeptical, calling this a cry to get more advertising dollars. Before you start fleeing Instagram, let’s talk about the good news. Instagram is still a powerhouse and especially for the younger crowd. Its the place where teens are introduced to new products. And while change can always be scary there are ways to minimize the effects. We have some hints into what the algorithm will look like and that means if we start now we can get ahead of the game and make sure that your images are going to show up in that “relevant” category. The first thing I want you to do is think about what we know about the new algorithm. Relevant content is content that is similar to the stuff you like and engage with. So, how are we going to get your content liked and engaged with? That’s not that hard. And I’m going to tell you exactly how to do it. Put yourself in your customers shoes. What will make them like your content? Duh….great content! Without this, you are doomed. So, before anything else you need to start thinking about upping your Insta game. What works best on Insta is lifestyle like photos. These are real photos that capture a moment in time. This is where you want to be. Start liking and engaging with relevant people’s content. Wait, isn’t this about people liking my content? Why yes, yes it is! But remember, Instagram is a community and people reciprocate. When you like what people share, they like what you share. So by targeting users who are like you and like the stuff you share, you are going to increase your chances of them continuing to like your content and that will have a lot of value in the long run. If you think about it, this strategy is no different than the strategy I’ve been promoting for awhile now. So if you already do this, you are already ahead of the game. Go you! What do you think about Instagram’s upcoming change? Are you excited?